HIALEAH, FL�JANUARY 17, 2016�Carters Sixty Six won the $30,000 El Nino Invitational Stakes and String Bet took the $25,000 Hialeah Junior Maturity on Sunday's undercard at Hialeah Park. 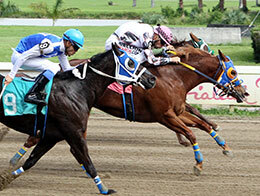 Under jockey Agustin Silva Carters Sixty Six put in a determined effort to defeat Carless Lightning by a head in the $30,000 El Nino Invitational Stakes Sunday afternoon at Hialeah Park. Fast N Famous Eagle finished half-a-length back in third. Saddled by Judd Kearl for owner Byron Gardner, Carters Sixty Six covered the 400 yards in :19.383 seconds to earn a103 speed index with a 15 mph tailwind. This was the second career in seven starts for the Kansas-bred daughter to multiple stakes sire Carters Cartel. Third in the Sam Houston Juvenile Invitational last year as well a finalist in the $100,000 TQHA Sires' Cup Futurity at Retama Park last summer, Carters Sixty Six used the $18,300 winner's purse to boost her career total to more than $41,000. Michael Samples bred the filly from the Sixarun mare Going Sixty Six. Winner of the aforementioned TQHA Sires' Cup Futurity and the $151,500 John Deere Juvenile Championship last year, Careless Lightning picked up $5,700 for his second-place effort. Rick Robinson trains the son of champion American Runaway for owner Jesse Gibson. Bred in Oklahoma by Bobby D. Cox, from the Corona Cartel mare Corona Edge, Carless Lightning has compiled an (8) 4-2-0 record and earned $156,669. Leading rider Larry Payne was up. Owned-and-trained by Joe M. Davis, Fast N Famous Eagle was ridden by jockey Rolando Del Rio Pina. The multiple stakes-placed One Famous Eagle colt is out of the Heza Fast Man mare One Fast Kisser. Bred in Texas by Oscar Lozano, the bay picked up $3,000 for the effort, brining his bankroll to $51,312. Completing the field were Volcom Bay, The Next Good Reason, Hearts Ona Hero, The Charmed Ruler, Toastin With Coronas and Totti. Under jockey Cristian Esqueda, String Bet got up late to defeat Political Debut by a neck in the $25,000 Hialeah Junior Maturity. Parti Favor finished another neck back for third. 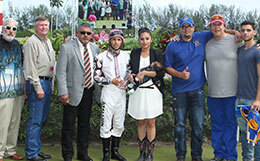 Elio Vazquez saddled the son of Tinys First Corona to his third career win in eight starts for owner Stephanie Flores. The sorrel gelding completed the 440 yards in :21.323 seconds, a 102 speed index with a 10 mph tailwind. The $15,000 winner's purse boosted his career earnings mark to nearly $50,000. Roger Knight, Jr. bred String Bet in Texas from the Separatist mare Check The Account. R.L. Rick Robinson saddled runner-up Political Debut, a graded stakes-placed daughter of world champion Apollitical Jess, for Garza Laurel Partnership, LLC. Second in last year's Adequan Derby Challenge Championship(G2) at Lone Star Park, Political Debut picked up $4,750 for today's effort which brings hear earnings mark to $99,943. 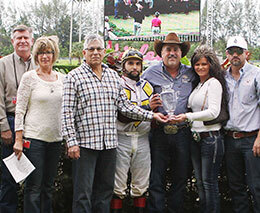 The winning connections of String Bet accept the Hialeah Junior Maturity stakes trophy Sunday afternoon. Bobby D. Cox bred Political Debut in Texas from the First Down Dash mare Sizzling Lola. She has compiled a (15) 4-6-3 record. Agustin Silva had the riding call. Owned-and-trained by Joe M. Davis, Parti Favor was ridden by jockey Rolando Del Rio Pina. Jesse Miles bred the multiple stakes-placed son of leading sire Pyc Paint Your Wagon in Oklahoma from the Feature Mr Jess mare Funparty. He earned $2,500. Streakin Regard, Fyre Fly, Wilson Wheelz, Logans Zoomin, Ipolito, Just Eagle and Eyes Have A Fortune completed the field.